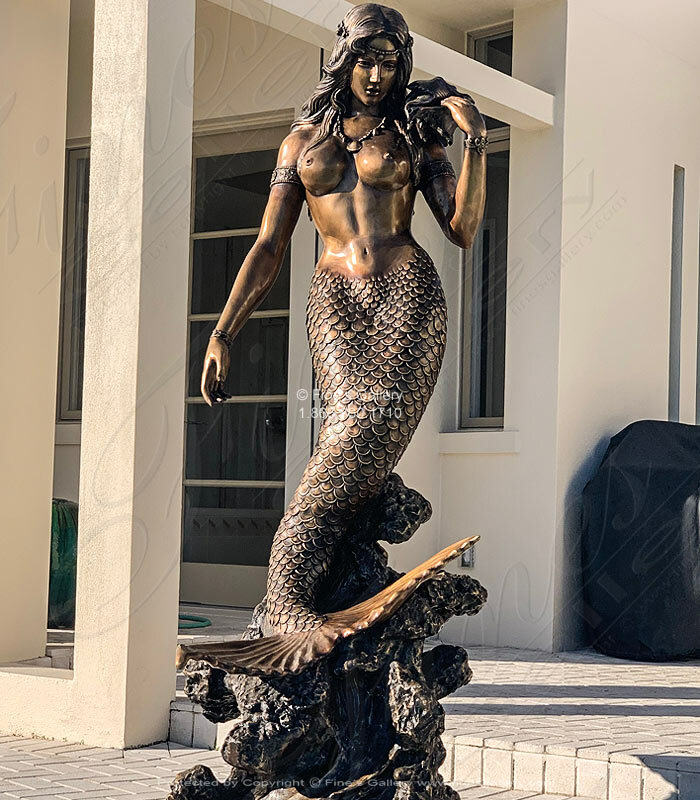 Cast in lovely patina bronze, this bronze mermaid fountain gently holds a seashell as she lets water stream unto her lower body.Abeautiful depiction of thisincredibly realistic creature. This fountain makes a perfect centerpiece. 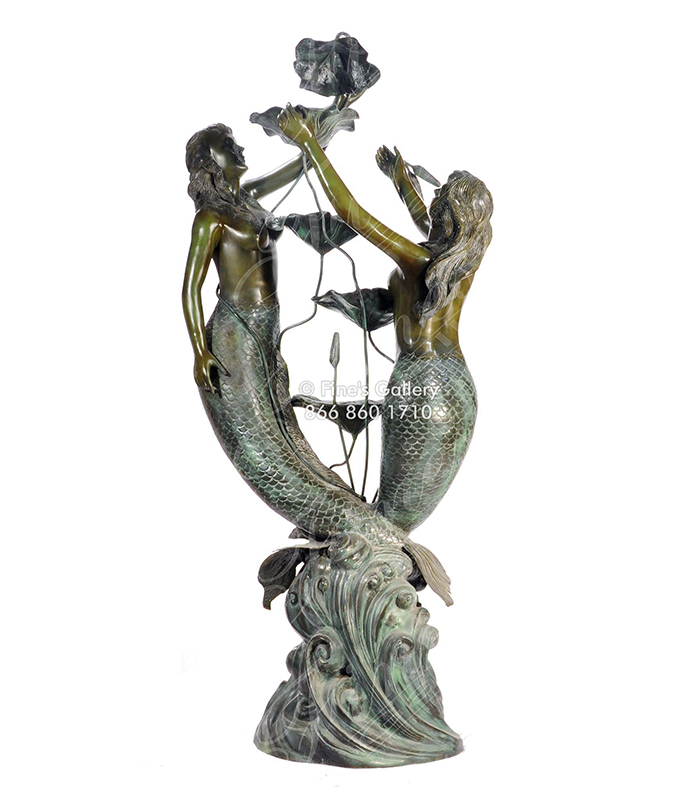 The twin mermaid bronze pedestal fountain with our marble pool is cast in our classic bronze. 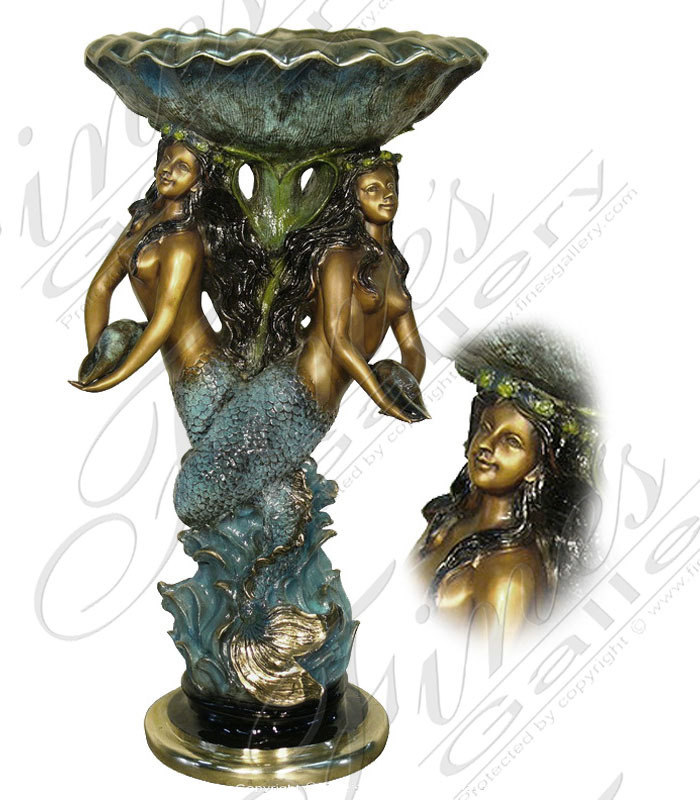 Featuring highly detailed twin mermaids with lily pads that serve the unique water flow, custom shaped pool accentuate the true beauty of this pedestal fountain. 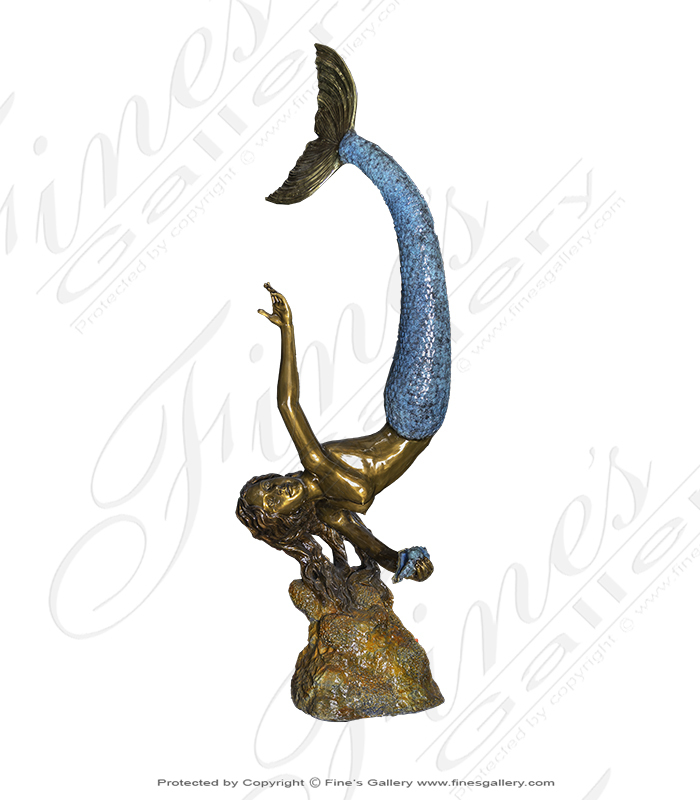 This colorful bronze mermaid gracefully poses while holding a conch shell. The perfect poolside water feature. 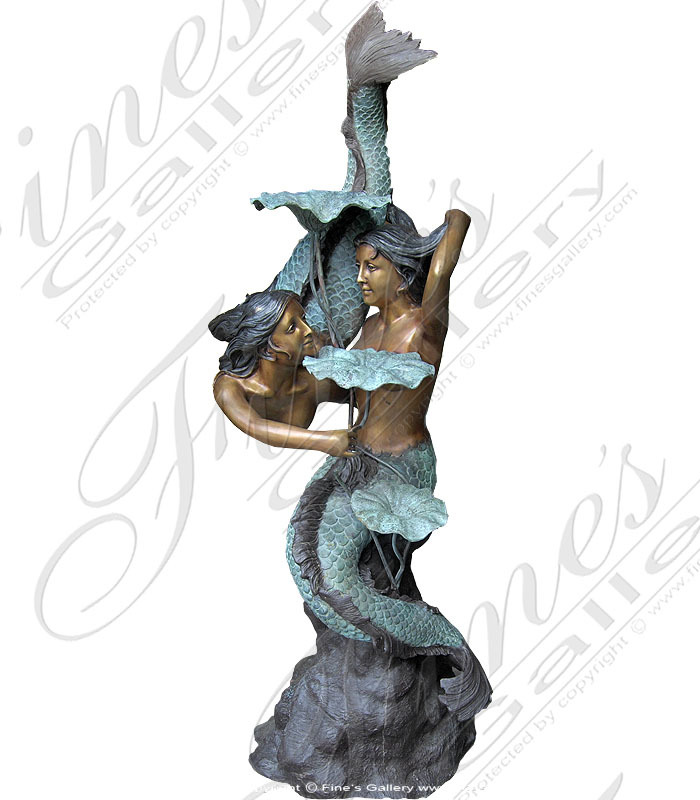 The two mermaid pedestal fountain is all cast in our classic bronze. A beautiful addition to your home, garden or pool area. 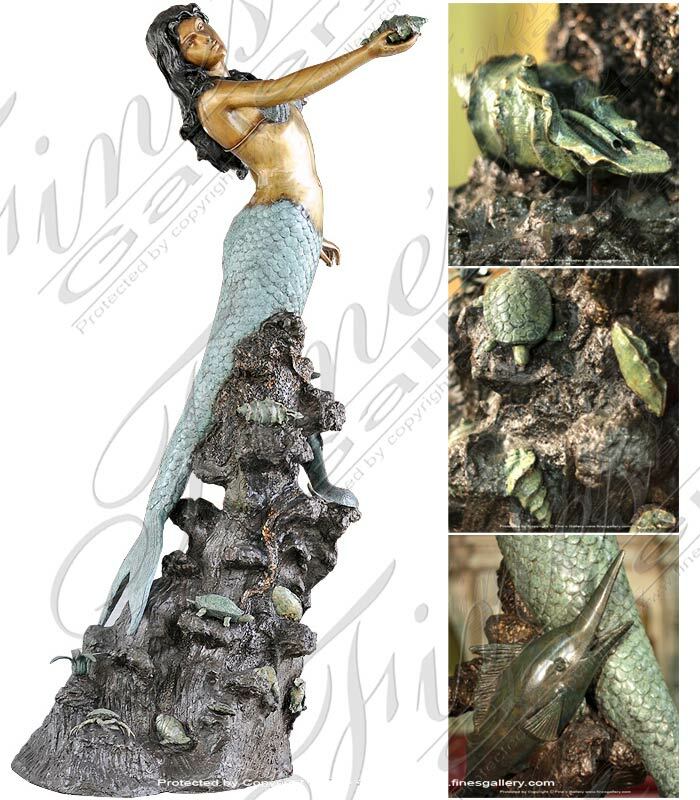 Featuring highly detailed twin mermaids, unique three pedestal lily pad water flow design, and simulated rock base. 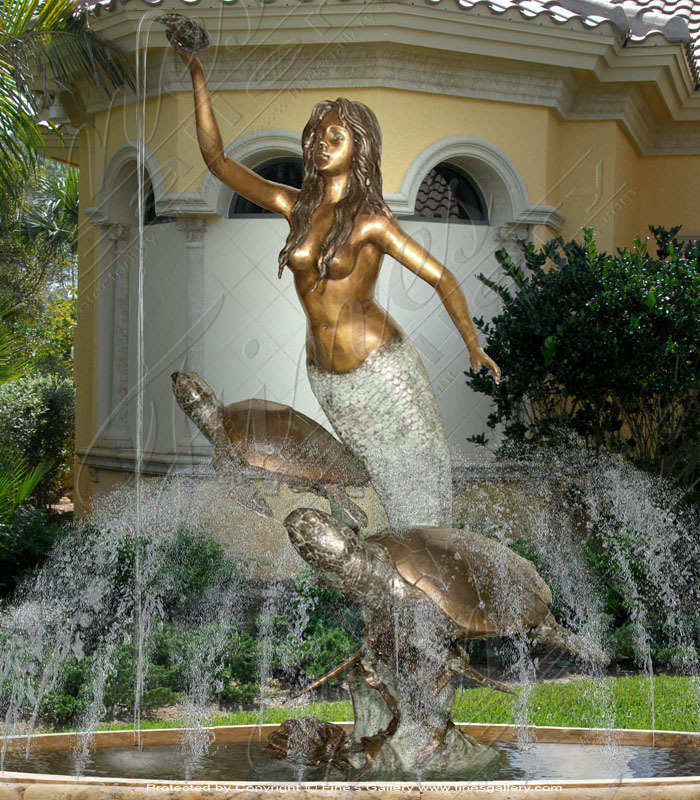 Winding around a large base, two lovely and playful mermaids squirt sea shell fountains into a shallow pool below, while supporting an ornate, scallopedbasin. 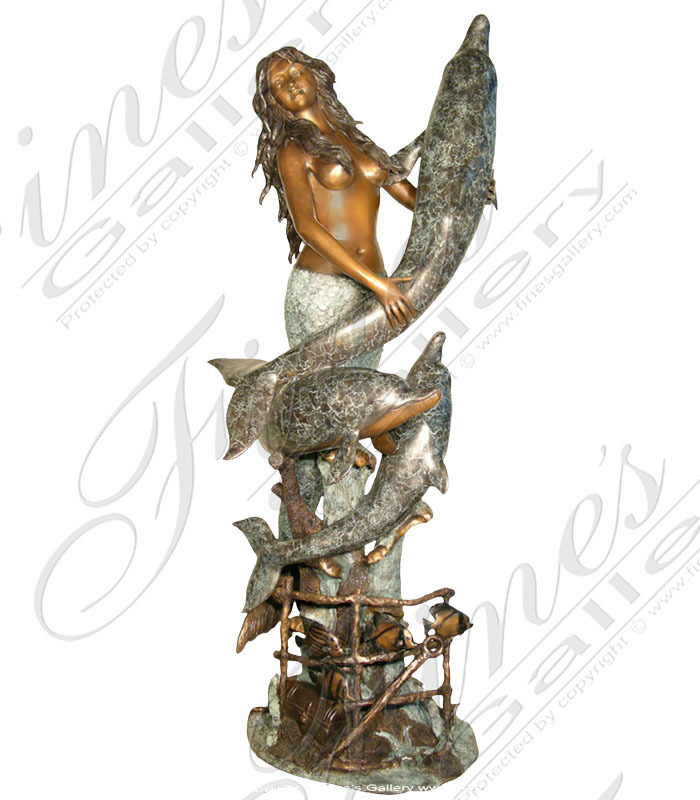 Made from several colors of bronze, a terrific piece to add to your collection. 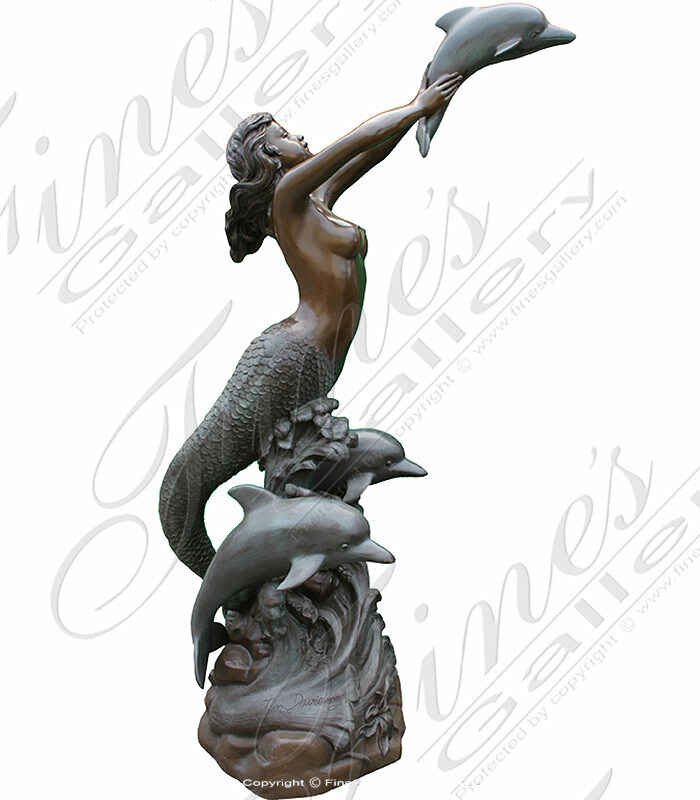 A gorgeous mermaid jumps through the waves, holding a small dolphin fountain in her hands. 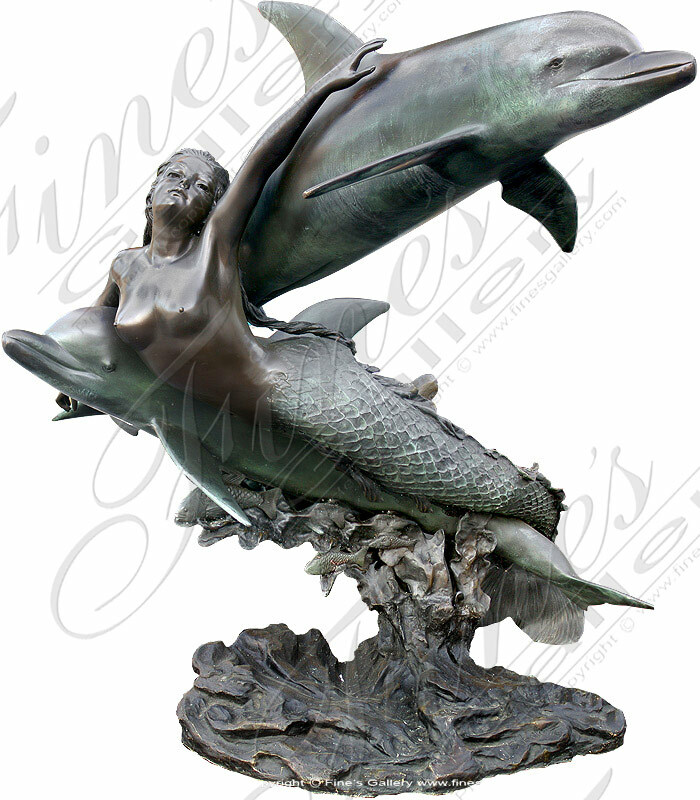 The base is made of a blue ocean wave design and features two more dark bronze dolphins. Amazing life like detail in her figure, made from gold and green bronze. 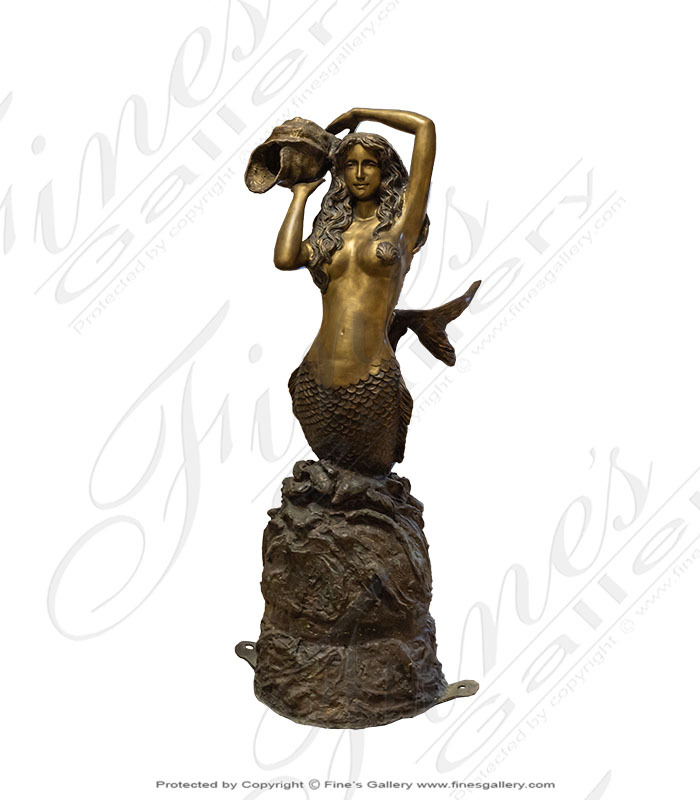 Majestic and alluring, this gorgeous bronze fountain depicts a beautiful mermaid and swimming sea turtles. With incredibly realistic detail, she gracefully raises her arm to pour water from a sea shell. 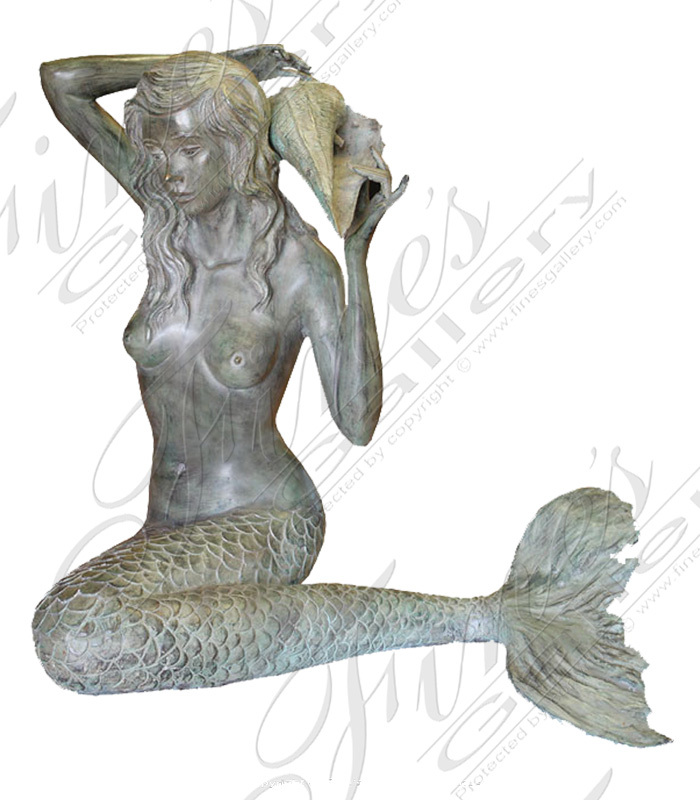 A fine piece to decorate your yard or pool. 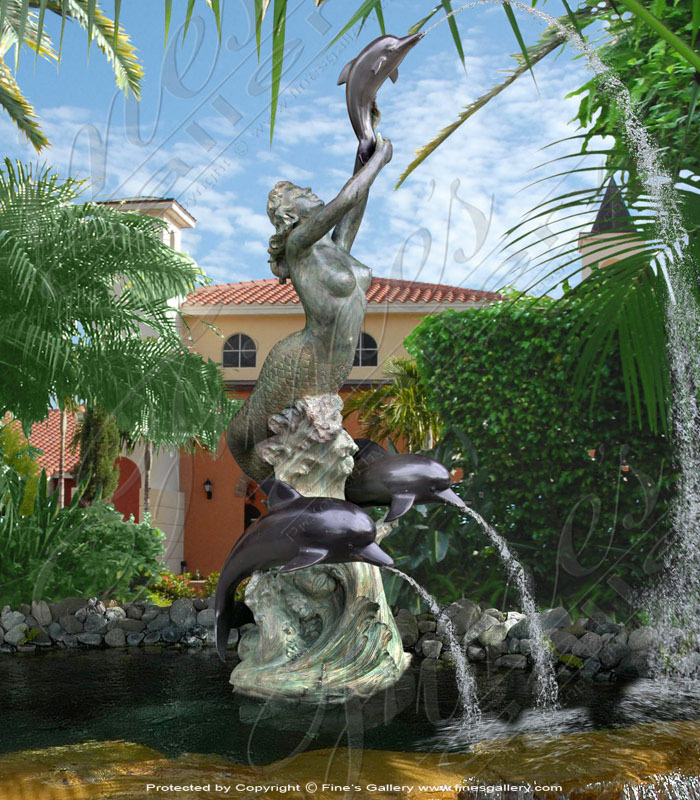 This gorgeous fountain features a beautiful mermaid swimming with two dolphins in a combination of bronze colors. Hand crafted to appear life like, as water sprays from dolphin mouths. Granite pool basin and water jets sold seperately. 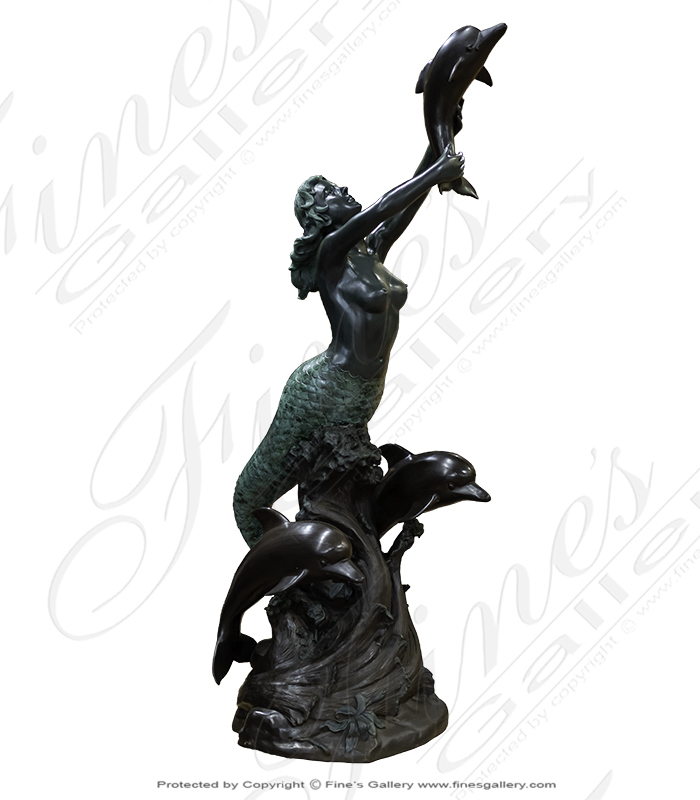 This bronze masterpiece is beautifully carved in bright tones of bronze and portrays a beautiful mermaid female circled by a friendly bunch of dolphins. 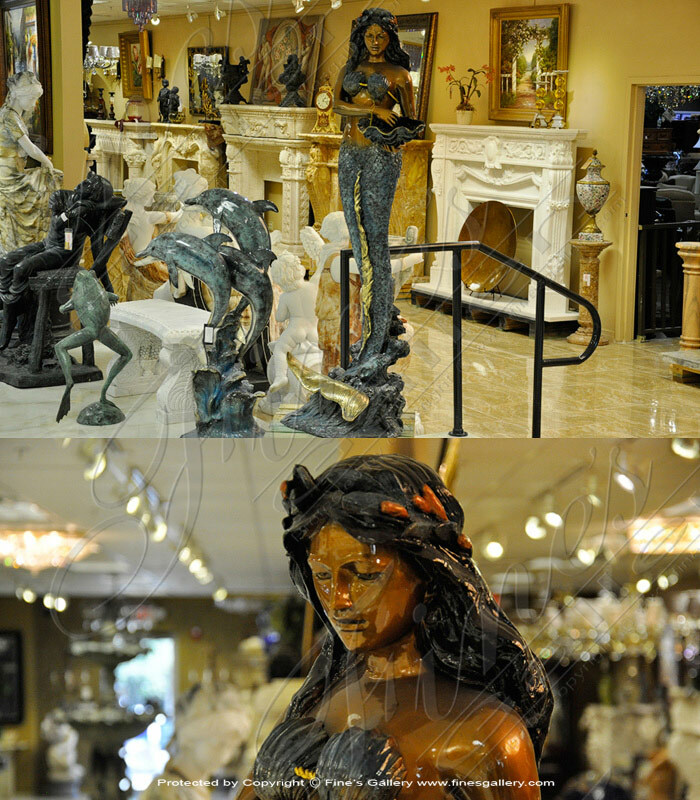 Artistically rendered with amazing skill and meticulous detail, this bronze fountain is magnificent.